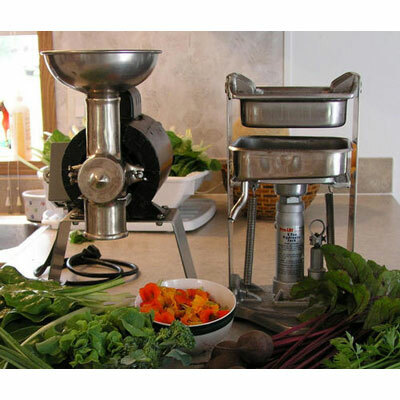 Has anyone ever heard of or have any experience with the K and K juicer? It would get old real fast. It's a manual Press Juicer, as opposed to the Norwalk's motor Press. I've never used one, but I have the Norwalk. basically, the same thing as a Welles Press. Go here and search on Welles Press. I think you will find at $400 too expensive compared to the alternatives. Plus you may have to break up some produce before putting it into the Welles Press. Agree with Yogi. Thank you Yogi, but I was referring to the K and K shredder juicer,it appears to be similar to the Norwalk with a one horsepower motor,60 cycles; and 1750 rpm.Do you know anything about it? Thank you very much for your time and effort. Thanks for the clarification. I did not even realize there was a K&K Shredder unit to accompany the juicer. The only site I could find that even sells it is this one. And there is no price. Apparently the design is very old, which isn't necessarily a bad thing. So, is the Norwalk which this appears to be based on. When you find out the price, you may want to take a look at this video and compare. Again, I think the Welles Press and the K&K press are basically the same. Good luck to you. Edited 1 time(s). Last edit at 03/27/2011 02:26AM by pborst. I have been using a Welles Press for a few years in conjunction with a a manual single auger juicer primarily intended for wheatgrass. A year ago I got an Omega 8004 which has pretty much replaced the use of the manual auger (lately I use it with the blank plate and use the Welles Press for all juice extraction). I am about to purchase a Norwalk 275 (because I think it's the best model they made, better than the newer 280). My reasoning for this is to get the best quality juice in a more straightforward manner. Doing it manually isn't just a matter of more work - the increased time means the juice is sitting there oxidizing for longer before I can drink it, especially as my wife and I tend to make about a gallon each time we juice. Been juicing long enough to know I'm serious enough about it to justify the price tag, and while the 8004 is not a bad juicer it's not so great on it's own (doesn't extract as much and leaves pulp in the juice), and is made entirely of plastics which I'm not a fan of. I believe the Norwalk 275 to be the best juice-creating device money can buy. Just in case anybody thought that people were getting clever and creating a cheaper way to make Norwalk-quality juice - in fact they are just copying Norwalk's original designs. Edited 2 time(s). Last edit at 02/12/2015 05:05PM by raptelan.